Just over a week ago both the boat and I came off the water for the winter. The timing was good – a few days later a storm came by that blew at about 40 knots, not all that far out to sea from here. It was lovely to watch the rain, and the wind in the trees, from the snug side of a cozy window on land. happily inside the mostly-completed boat shed, entirely out of the weather for the first time since it left the shipyard where it was built, in 2008. It’s feeling very luxurious to not have to worry about the PVC frame and tarp process. It’s feeling even more luxurious to be able to climb into the boat without wriggling around under the driveway winter arrangement just to make a foray into the cabin. Hauling the boat out of the water was interesting, in this new and different location. The ramp that was nicely out of the wind and waves, just a mile by water from the new house, is not as steep as the ones we’ve used before (steep is good, when it comes to ramps for boats with keels). There aren’t photos of how this went, as every single person was completely involved in trying to make things work, but we’ll try for that next time. For years a webbing tow strap has been part of the boat towing kit that has ridden around in the van, with all the other boat hauling paraphernalia, from hitch balls to tiedowns and wheel chocks. The tow strap was still in its wrapper, up until this past week. Finally it got put to use. This tow strap procedure was quite theoretical, being something that I had read about and thought through, but never tried. 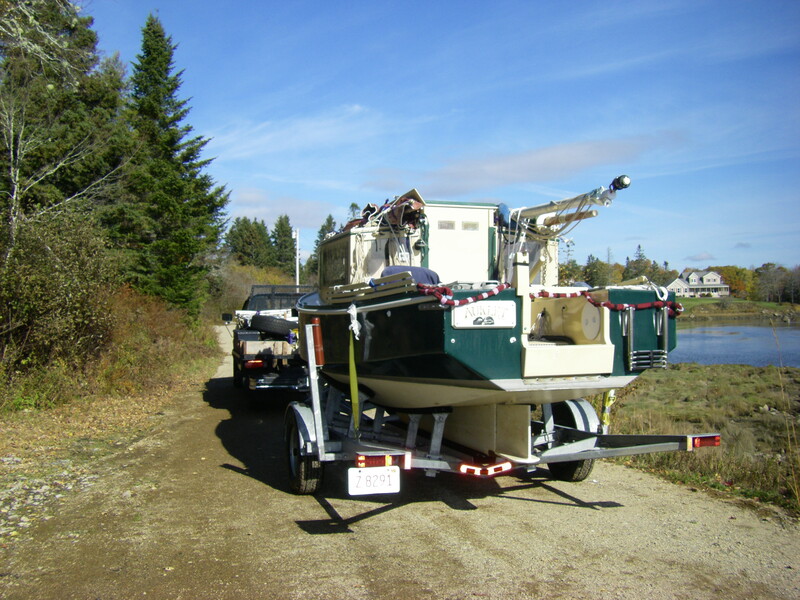 When a ramp is too gradual to allow the trailer into water deep enough to float the boat without dousing the tow vehicle, it’s possible to unhitch the trailer from the vehicle (with the little jack wheel on the trailer tongue in its down, load-bearing position), attach the tow strap to the trailer hitch, and let the trailer farther down into the water. It helps to take a turn with the tow strap around the hitch ball on the vehicle, so the trailer doesn’t just pull the person holding the tow strap right into the drink along with the trailer. Once the trailer is in far enough for the boat to float onto it, the wheels are chocked; somebody has to do some rather serious wading to manage this. Melissa brought her wetsuit, which was a good thing because there was frost on everything the morning of the day we did this maneuver, and we were out there at about 8 AM to catch the tide. 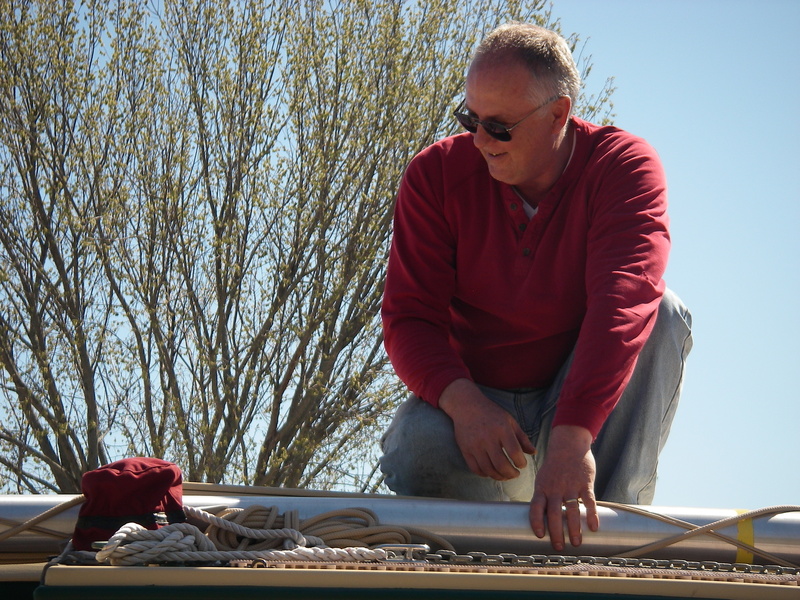 Once the trailer is securely chocked and the boat pulled into place and secured on the trailer, then the tow strap can be hooked onto the tow vehicle, and up you come, out of the water. We had some suspense about the plastic chocks, and what would happen to them next when the trailer wasn’t there anymore, but they floated neatly up to the surface and were easily retrieved. Once out of the water, the trailer is chocked again, and then reattached to the tow vehicle. In a more orderly world, meaning one in which you had not first tried to get the boat onto the trailer without this process, with various complications related to falling tide and a boat half on the trailer, it would make more sense to chock the trailer before it’s in the water. Then you could unhitch, hook the tow strap onto the trailer, move the tow vehicle farther up the ramp, hook the other end of the tow strap to the vehicle, and let the vehicle ease the trailer into the deeper water, where it would be chocked again. Next time! That could’ve been done this time also, if we had thought it up, but as it was things worked out okay regardless, thanks largely to the seriously-strong member of our boat-hauling team, Richard (seen this past spring). The AUKLET trailer also has a telescoping tongue extension, and at steeper ramps that’s enough to do the trick for floating the boat on or off, even with the long shallow keel that requires somewhat deeper water. It’s nice to know that the tow strap arrangement actually works, for when the tongue extension is not enough to keep the tow vehicle’s wheels out of the water. Tires in the water are okay, but nobody wanted to see the hubs and brakes of a good truck down there in the salt. 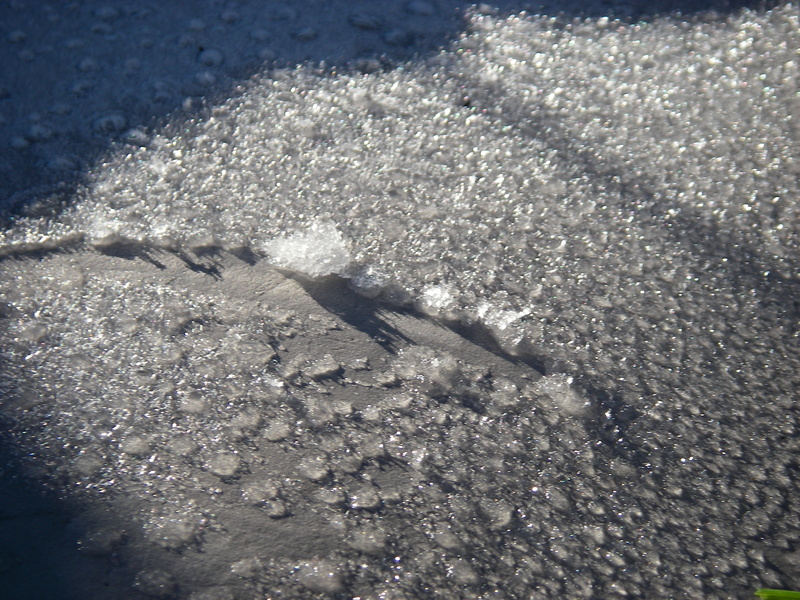 The concrete ramp that we used, at the head of Joy Bay in Steuben, has narrow horizontal grooves for traction. The small trailer jack wheel rolled over these grooves easily. Some concrete ramps, such as the nice new one on the Connecticut River in Holyoke, Mass, are made of individual concrete slabs with a more substantial horizontal gap between the concrete sections. I would have concern in trying this tow strap arrangement on that ramp, probably wanting something to put under that small tongue-jack wheel as a runway across those gaps. Otherwise, if the wheel were to turn sideways and fall in a gap while the tow vehicle and trailer were still moving, that could be the end of the tongue jack, with much breaking, falling and scraping and difficulty getting the tongue both up the ramp and lifted back onto the tow hitch. It was with great relief that I first saw our concrete ramp on Joy Bay with its narrow indented traction grooves, when I went to look a couple of days ahead of time. I’m not perfectly sure what I would use, on the other kind of concrete ramp. A simple board, plywood or one by something, would want to float rather than stay in place. A couple of convenient pieces of stiff sheet metal, leapfrogging one in front of the other, might be nice, or perhaps a weighted board… If anybody has experience with this and would like to comment, I’d love to hear. As it was, the trailer cooperated nicely, the boat came out of the water, the rig came down (okay, that took a little while), and off we went. It was a treat to go only 3 miles or so by road from the ramp to the house, rather than the long drive from somewhere near the ocean back to Holyoke. Moving to Maine is lovely on so many levels. 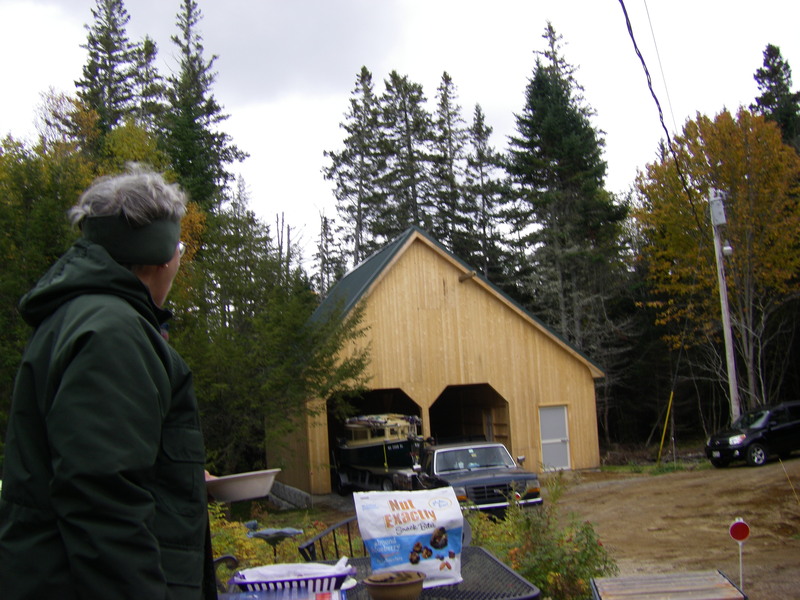 Many thanks to everybody who made this haul-out work: Melissa and Richard, again with their truck, Suzanne, who does so much to organize the land side of this whole operation, and our new neighbor in Gouldsboro, Chubba, who came out so early in the morning to help. This all took place on Saturday, October 24, somewhat more than 5 1/2 months after the spring launch, on May 2, in the Connecticut River. During these months I was on shore in the new house for a total of nine nights, over three different visits; all those other nights, and most of those days, I was aboard AUKLET. 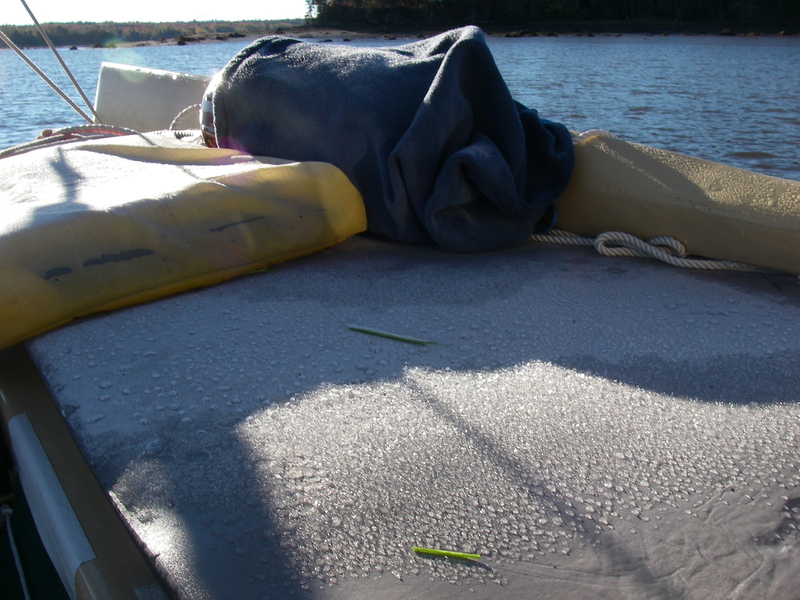 It’s a special thing to live on the boat for so many months, and it’s special again to move back onto land. Many thanks, once more, to everybody who helped to make all of this possible. Winter well, all of you!